At Bharany’s, a family-run jewellery company in New Delhi’s upscale Sunder Nagar neighbourhood, a client came in recently with a 70-year-old turban pin—typically worn by a groom on his wedding day— studded with white sapphires and small emeralds. Called a kalgi, after the Persian word for a heron’s plume, the feather-shaped ornament was crafted in Rajasthan in a style harking back to the Mughal court’s princely custom of sporting impressive gems on its turbans. The client’s request: Find some new use for the inherited pin, which had been languishing in a bank safe-deposit box for the past 20 years. In the hands of 45-year-old jeweller Mahesh Bharany, the pin was turned upside down and reborn for modern dinner-party wear as a woman’s pendant suspended on three strands of pearls and emeralds. Women in India “want more things they can wear today and make a statement. Something that will make them stand out", says Bharany, who adds that similar requests to remodel inherited jewellery are coming his way these days. India boasts a trove of inherited jewellery. It’s the natural legacy of a land rich in gemstones and a culture that’s infused with an enduring dowry tradition, a deep-rooted passion for gold, and age-old beliefs in the protective powers of certain jewels, according to Usha Balakrishnan, author of Indian Jewellery— Dance of the Peacock, an illustrated history of 5,000 years of Indian jewellery. Of course, fashions change. To keep up, some members of India’s royal families didn’t shy away from updating centuries-old pieces in their efforts to reach the pinnacle of style. In the 1920s and 1930s, for example, the country’s gem-besotted maharajas made a beeline for Europe and called on leading jewellers such as Cartier and Van Cleef and Arpels to reset their heirloom pieces. Women “want to use whatever they have", says Arjun Jain of Padma Gems, a 150-year-old high-end jeweller in New Delhi whose clients typically wait three months for a refashioned item and pay between $1,000 (around Rs50,000) and $2,000. In most cases, these reconstructions aren’t a mad dash to melt down all the gold, pluck out the precious stones and order an entirely modern accessory. Thanks to a renewed appreciation of the style of India’s heritage jewellery, many women and their daughters are choosing careful modifications. Take, for instance, Asha Bansal, a 52-year-old Delhi-based fashion designer whose father was a jewellery buff. Last November, Bansal converted a thick bracelet laden with Colombian emeralds, which she describes as a century-old piece her father obtained at an auction from a royal family in Rajasthan. The 30 emeralds, all eight-carat baguettes, were “wasted in a bracelet", says Bansal, who thought “something closer to my face would be more eye-catching". Her jeweller sketched five options, most of them ornate designs that required additional jewels and a platinum setting. In the end, Bansal opted for a design of a more delicate oval necklace with the emeralds encircled by diamonds that reflected the gemstones’ royal history. The diamonds came from another piece from her father’s collection—a 50-year-old pair of diamond and emerald earrings that she deemed “too traditional to get any mileage out of". 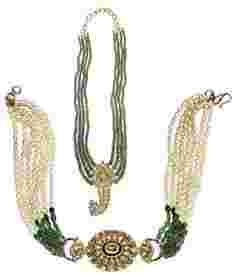 Bansal has since worn the necklace to a cocktail party where she says she could be sure of running into guests who would recognize the quality of the piece. She also wore it to a wedding. “I chose something that I could wear with trousers, or a sari," she explains. The eight-month project—from sketches to finished piece—cost about $5,000. Some of the most intriguing innovations involve a change in function. Antique women’s bangles become luxury handbag handles; smaller children’s bangles are recycled as decorative necklace clasps. “Many pieces originally made for men are now worn by women, sometimes necessitating modifications," says Amin Jaffer, international director of Asian art at Christie’s, London. For example, male armbands are retooled as women’s chokers. Above all, practicality takes precedence. A ruby hair ornament, for instance, served ladies of southern India for years, enhancing the sheen of long, plaited hair. Now that styles have changed—for hair as well as for jewellery—Chetan G.R., the owner of jewellery store Arnav in Bangalore, often transforms old pieces into more wearable pendants or necklaces set in gold. “As a piece of jewellery, a hair ornament was useless. Gold alone is mundane. Once you fuse the two together, there is value," says Chetan, who charges between $100 and $500 and takes up to four weeks to complete a piece. Sometimes Chetan directs the redesigns; other times, the customers set the tone. At the insistence of one client, for instance, Chetan says a heavy, gold waist belt—usually worn by a bride on her wedding day—was transformed into a choker, an idea, he says, that struck him as rather garish. Such conversions account for 40% of Arnav’s business. Chetan, 35, comes from a long line of jewellers who settled near Mysore. “Jewellery has a lot of sentiment and history that I would like to pass on to the next generation," he says. “I don’t want it to wither away with our changing lifestyles, changing trends and changing preferences." What’s less acceptable in some quarters is to trade inherited jewellery for cash. Many Indians believe that jewellery absorbs the spirit of its wearer; and bad vibes—should there be any— could be passed along. At C. Krishniah Chetty and Sons, one of Bangalore’s most venerable jewellers, “we would not encourage distress sales", says C. Ganesh Narayan, a fifth-generation scion who serves as executive director of the company. The shop’s loyal customers are urged to remodel their inherited pieces rather than sell them. Not everyone is eager to modify old jewellery. Sniffs one Delhi entrepreneur: “It’s like turning your castle into a series of flats." Actor Shabana Azmi, who is known to favour antique jewellery, says an old traditional piece is “beautiful because it belongs to that time. To tamper with it is sacrilegious". As India’s wedding season shifts into high gear, some jewellers are busy with orders to alter inherited jewellery for those fabled trousseaus. Problems sometimes arise between generations when the jewellery is promised for wear on nuptial day, but isn’t legally bestowed on the bride, says Bharany. “Old people never like to change things," he explains. In Bharany’s experience, there’s “always a tussle" that the grandmother usually wins, with the pieces remaining untouched “unless the child actually inherited the jewellery".